Studied: Arts Students League (New York); Member: National Academy of Design, American Watercolor Society, California Water Color Society. Douglass Parshall grew up in New York and began receiving art instruction from his father at an early age. He continued his education at the Art Students League, and in 1917, moved west with his family to settle in Santa Barbara. In the late 1920s and early 1930s, he traveled with his family to China, North Africa, Italy, France and Mexico. He painted extensively on these travels and had a chance to view a wide variety of art. In addition to painting watercolors, Parshall produced oil paintings, limited edition lithographic prints and portraits. 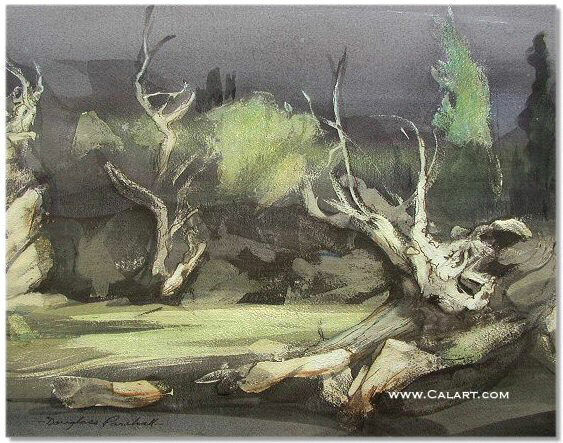 Occasionally, he instructed small groups of advanced art students and in 1947, was president of the California Water Color Society. Interview with Walter Silva, 1983. 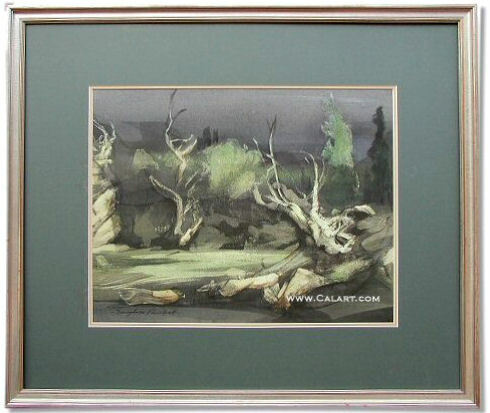 Original California Watercolor by National Academy Artist Douglass Parshall...in Gallery Frame. Painting is signed lower left "Douglass Parshall". Entire piece measures 25" x 29", painting is 15" x 18 (sight)" & is in Excellent Condition.